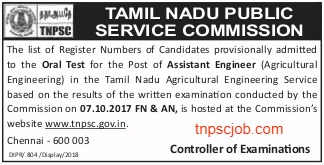 Tamil Nadu Public Service Commission has been announced Assistant Engineer Result on 22nd June. Candidates are able to check TNPSC AE Result 2018 via Register number from the official website. The selected Candidates provisionally admitted to the Oral Test for the post of Assistant Engineer. The oral test date will be announced later by TNPSC. So aspirants, regularly watch the new updates of TNPSC Official website or Our website.